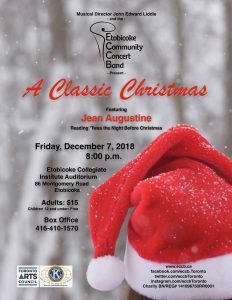 Nyela d’Endel (alto sax, Symphonic Band) invites fellow band members to hear and support the Etobicoke Community Concert Band, for their annual Christmas Gala on Friday, December 7th at 8:00pm, 85 Montgomery Road in Etobicoke (Etobicoke Collegiate Institute auditorium). Featuring guest Jean Augustine as the narrator of Clement Clarke Moore’s ‘Twas the Night Before Christmas. Tickets are $15.00, kids 12 and under are free. Call the Box Office (416) 410-1570 and reserve your tickets today. It will be a toe tapping, carol singing evening to remember!